Project Description : The sacred Charub tree of Isawyia is the main symbolic relic of the village. 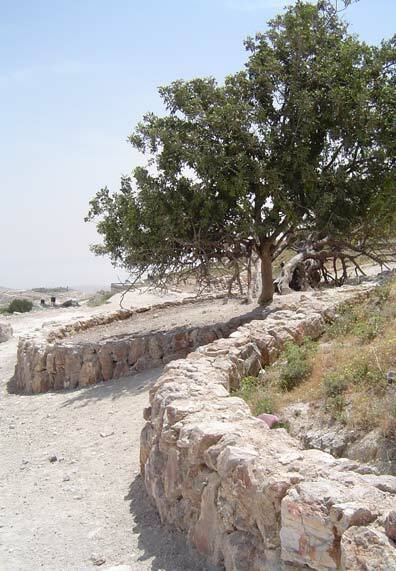 Christian tradition claims that Jesus (Isa in Arabic) sat underneath this tree with his disciples. Moslems maintain that the tree was the meeting place of Saladin's generals (1187), one of which was named Elmuadem Isa – hence Isa-wyia. The tree is believed to posses supernatural powers and can fulfill wishes, judge between opponents and even produce rain in years of draught..
June – First prize, the Jerusalem environmental projects competition. In the area surrounding the tree (Stage II). Key Meanings : 'Sacred tree' – Moslem & Christian traditions, reinstating the sacred space, unexpected collaboration in political chaos, Creative Preservation, community participation.. Artist Statement : Conservation works included apart from cleaning the area, construction of low circular walls of the local flint stone, which surround the tree, protect it, preserve its earth and define its sacred space. The work was realized by the local community: the dignitaries of the village, the crew of the cultural association and its children, local workers and the neighbors. The sacred Charub tree of Isawyia can project a spirit respect for the signs of the past and for nature, in midst of political chaos, a source of pride for the inhabitants of the village, their guests and for their neighbors..